Castle Comfort Stairlifts offers top brand stairlifts, keen prices and fast installs for all those seeking stairlifts in Falkirk, Stirlingshire. And all work comes with our no-quibble guarantees and famous customer service satisfaction. Falkirk sits about halfway between Glasgow and Edinburgh though slightly to the north. It sits at the junction of the Forth and Clyde Canal and the Union Canal which has stood Falkirk in good stead over the centuries in terms industry. This junction has produced one of Falkirk’s most iconic landmarks and attractions of recent times, the Falkirk Wheel. Essentially it is a boat lift to connect these two canals which had previously been linked by 11 locks. Where the canals meet there is a height difference of some 24 metres, the equivalent of 8 storeys. Imagine if the height difference between your ground floor and your bedroom was that high. You might need a stairlift for each flight. Fortunately for many of you who find the stairs daunting or painful or just plain impossible, Castle Comfort Stair Lifts can help. We can supply and install stairlifts supplied by all the main UK suppliers so there is something to suit everyone’s home and all manner of personal needs. Believe it or not there are already about 175 people in Falkirk who have succumbed to the charms of a stairlift. How do we know – take a look at our home page here to see our scrolling counter which keeps count. So if you’re living in the area and need one, you won’t be alone. 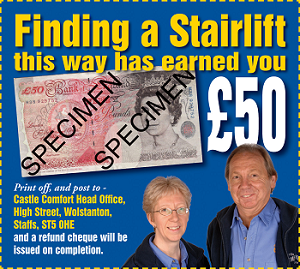 You can review our performance by seeing what others have to say and checking out our stairlift prices. Of course if you have any queries or need more information, please give our local office a call on 0131 242 0046 . The wheel is something else. And even it can’t deliver a boat directly from one to the other. The Union Canal is 11 metres higher than the aquaduct at the top of the wheel so that boats must still go through two locks to descend from this canal to the aquaduct and vice versa. The aquaduct could not have been placed higher due to the historic Antoine Wall which was built by the Romans. Then this amazing feat of engineering transports boats up or down that 24 metres so that they can be on their way on the adjoining canal. The wheel was opened in 2002 as part of the Queen’s Jubilee celebrations. During the Industrial Revolution, Falkirk was at the heart of heavy industry in Scotland. This included the iron and steel industries. James Watt cast some of the beams for one of his early steam engines here at the Carron Iron Works. They also manufactured Carronades – smooth barrelled canons - for the Royal Navy and then pillar boxes for all over the UK. I wonder what they’d have thought of them painted gold to celebrate gold medal winners in this year’s Olympics? Johnston Press was founded in Falkirk in the mid 1800’s. Now its headquarters are in Edinburgh and it is still the second largest regional newspaper publisher in the UK. The Scotsman, The Yorkshire Post and The Falkirk Herald are all published by Johnston Press. The A listed Callendar House was built in the style of a French Renaissance chateau complete with turrets. It dates from the 14th century though little of the original house remains. It has welcomed some important people through its doors including Mary, Queen of Scots, Oliver Cromwell, Bonnie Prince Charlie and Queen Victoria. In the 18th century the Forbes family acquired the property. William Forbes of Carron Iron Foundry bought the property for £100,000. The house now belongs to Falkirk Burgh Council and has been restored to its former Georgian glory, complete with a fully working kitchen of the period. It houses the local museum including a history research facility. The Dunmore Pineapple is described as a folly. It is the decorative motive on the wall around the gardens of Dunmore House home to the Earls of Dunmore. A ‘hothouse’ was built into the wall where pineapples were grown. The hothouse not only had a wall of glass to get heat from the sun, but was helped to keep high temperatures by a furnace heating system built into the wall too. This system circulated heat from the furnace through the wall cavities which heated the space. If you or someone close to you living in this attractive town needs help to get up and down the stairs, we can help. Castle Comfort Stair Lifts will have a solution to your problem. We can fit a stairlift in half a day or less and we offer 24/7 aftercare so that you are never left stranded. Compare the different stairlifts we supply for yourself and if you have any concerns, get in touch. If you need help with the costs, please take a look at the possibilities of a grant or a 0% finance deal. You can even use the £50 voucher at the top of this page towards the cost of your chairlift. If you want to get this started, give us a call on 0131 242 0046 .